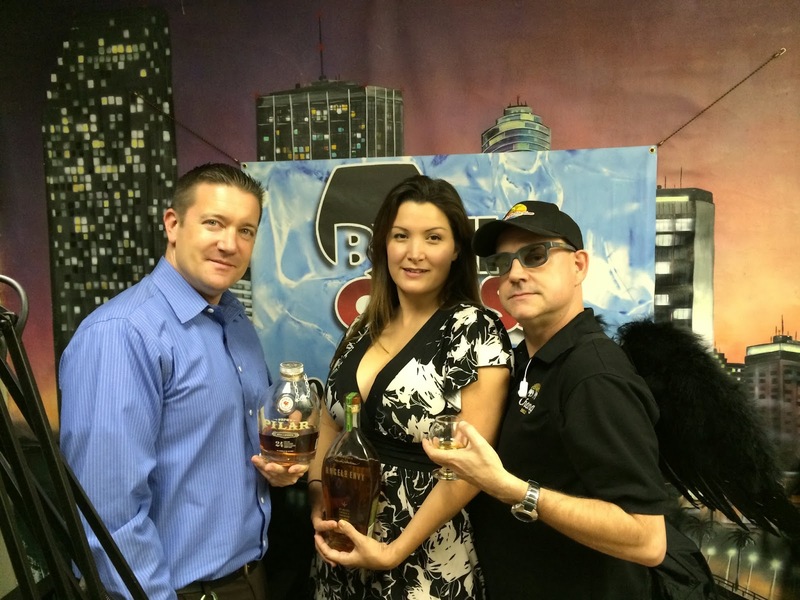 Last night I joined the ByTheGlassShow.com crew as they welcomed Pamela Obando, Brand Ambassador for Angel's Envy bourbons and Papa's Pilar rums. The theme was Valentine's Day Cocktails, though I did manage to drink my fair share of neat bourbon! And I have tried Angel's Envy before, but I could tell that this night was going to be epic! 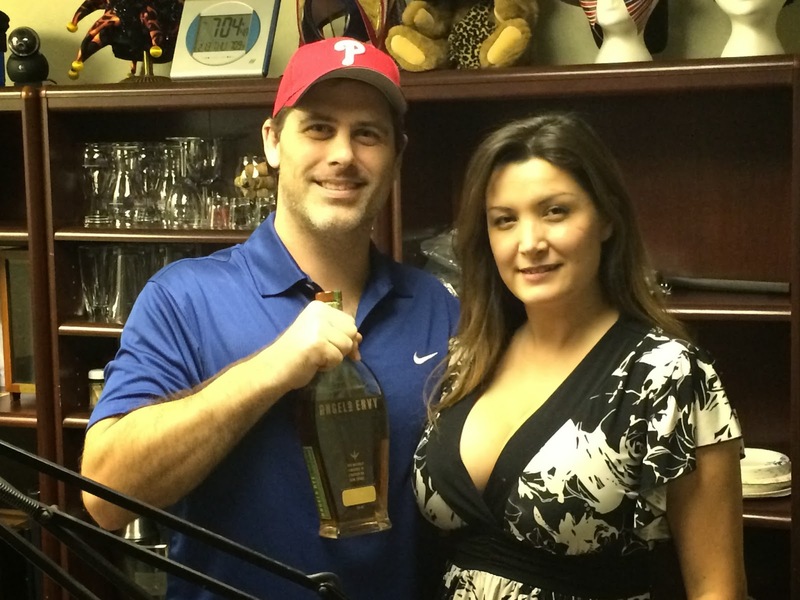 We started by discussing the contributions to the bourbon world made by Master Distiller Lincoln Henderson. That almost brought a tear to Pamela's eyes as it wasn't that long ago that Mr. Henderson passed. 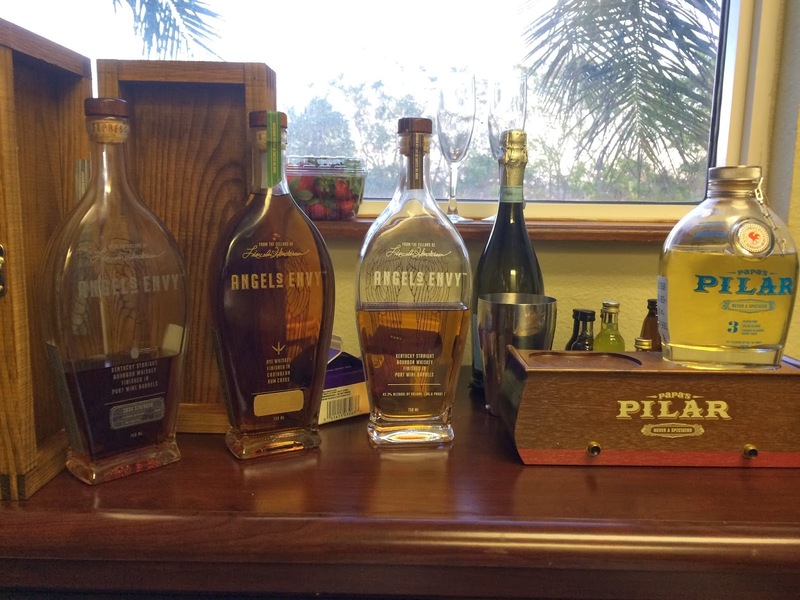 After 40 years as a spirits crusader, founding numerous bourbon brands, and becoming the inaugural member of the Bourbon Hall of Fame, Angel's Envy was his last great contribution! Pamela explained that Angel's Envy is a play on the term "Angel's Share," which is the amount lost to evaporation each year. After the Bourbon has been aged appropriately for 4 to 6 years, it is finished for 4 additional months in Port Wine Barrels. And that finish adds terrific complexity! 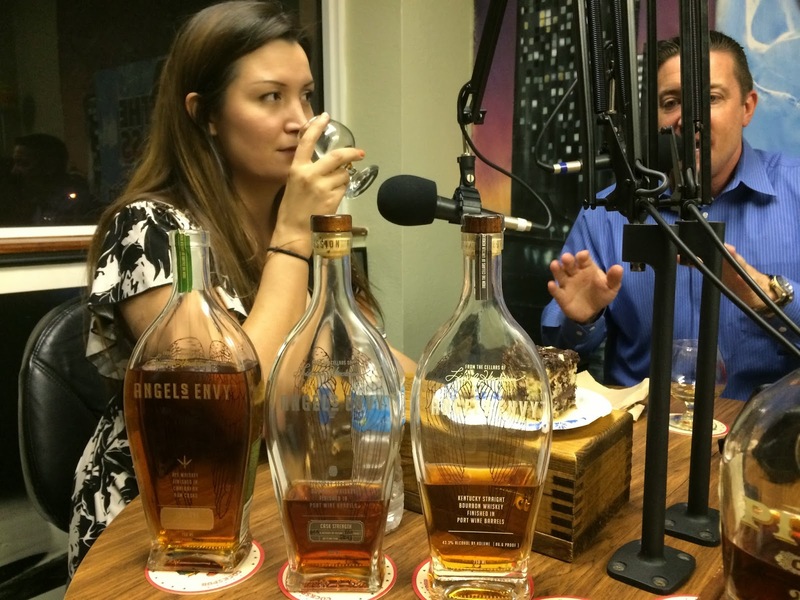 Despite being a cocktail-themed show, we started with a snifter taste of Angel's Envy. And we didn't start small and end big (like often done at beer tastings). 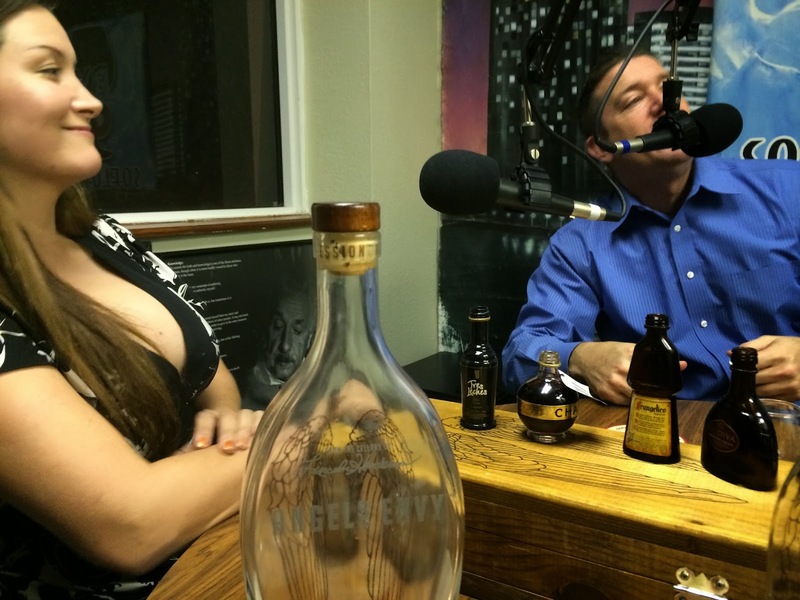 We started with the Cask Strength 123 proof Angel's Envy, which comes with its own wooden box. Wow! Vanilla and spicy aroma. Ditto on the flavors, but with a beautiful maple syrup sweetness and underlying fruitiness. Unbelievably smooth for the potency. Pamela then decided it was time for a cocktail, a new creation she thought up that morning, and we would name it. And it only took her a few minutes to make despite making the whipped cream and mixing multiple beverages in with the Angel's Envy. 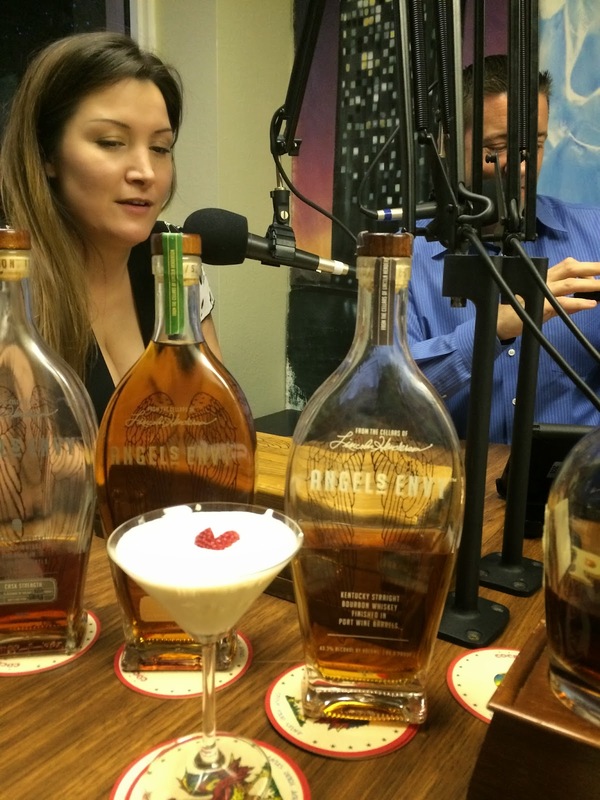 I did ask if she was really going to mix the Angel's Envy--I think she said "of course!" Along with the bourbon, there was Chambord, Godiva, Tres Leches, and Frangelico. And garnished with a strawberry cut into a heart shape. I'll link to a recipe when I get one. After agreeing with Jorge that the Chocolate and Bourbon were the key players, Jorge named it Angel Chocolate (must be pronounced in Spanish). You could taste other nuances as well. Delicious. 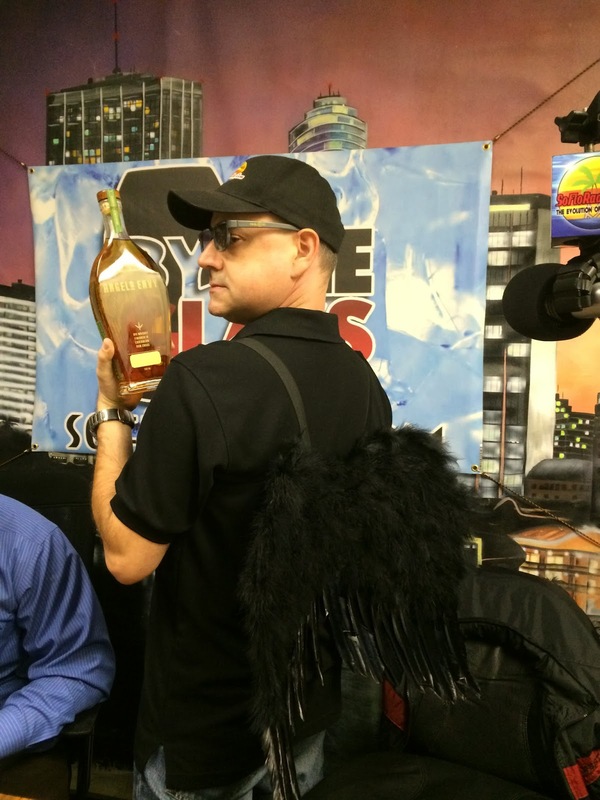 I think that was about the time that Jorge decided that he'd put on some Angel's Wings that he just happened to have laying around. LOL. Pamela joked that he made a nice angel model and that he could get a job at one of her promotional events. I think he may call. 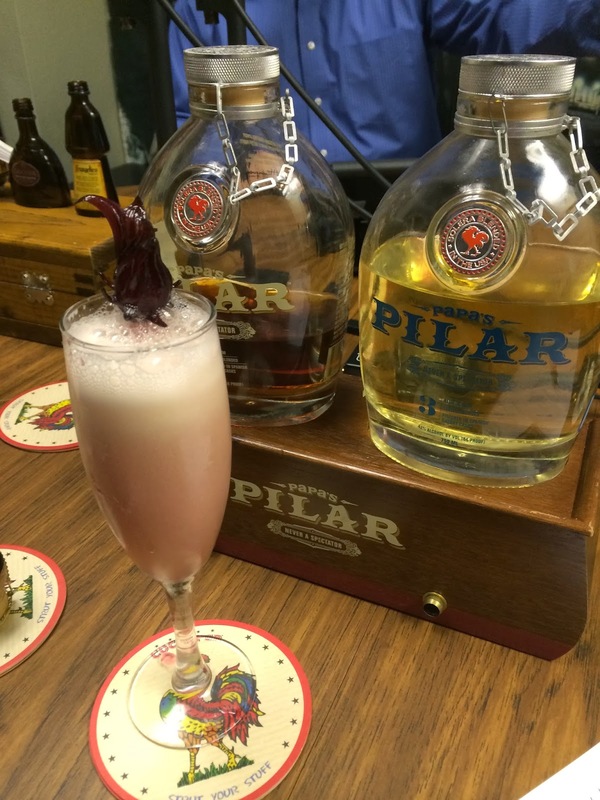 Cocktail #2 was made with Papa's Pilar Blonde Rum. 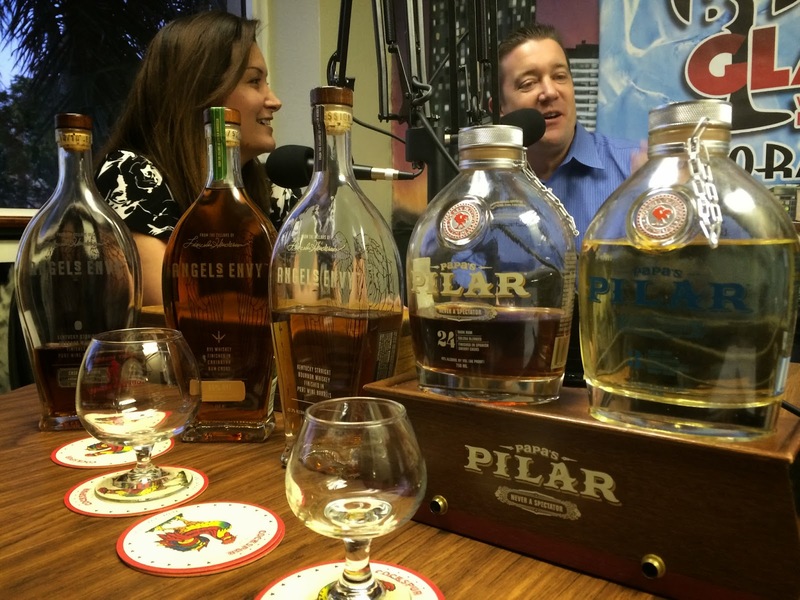 Yes, this is the Ernest Hemingway brand of rum. And the canteen shape of the bottle is so cool! Again, this was an original made with lemon sorbet, hibiscus, citrus limoncello, prosecco and the rum. Again, recipe to follow. It was garnished with an edible Hibiscus Flower and was pink for the occasion. Lemony, think and creamy, fruity, sugary and candy sweetness, and the bubbles made it even better. This cocktail was dubbed "Florida Flower," again by Jorge. I thought we were going to run out of time before we got to try the Angel's Envy Rye, so I raised my hand and asked. Out came a piece of chocolate cake which Pamela proceeded to pour a little of the rye over it. 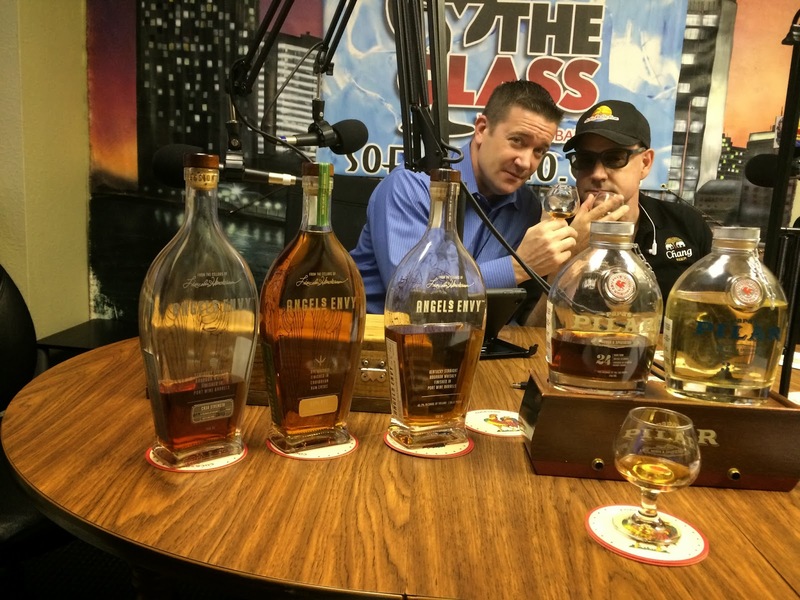 And we got a little in a new snifter too. And it was awesome! Seriously the creme brulee, vanilla, spicy cinnamon and fruity flavors were fabulous. I might have made a new best friend last night! Oh, and 100 proof. There was actually a third cocktail made after the show ended but I wasn't really a fan. 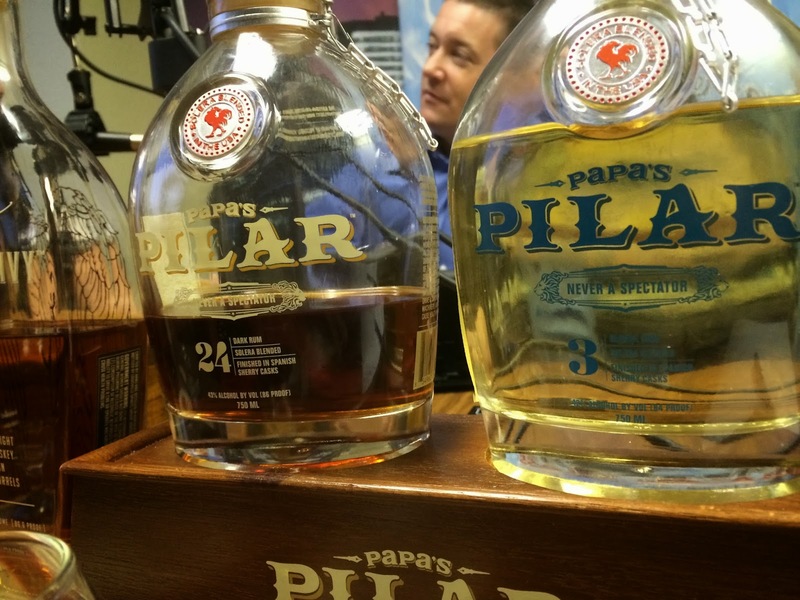 What I was a fan of was that I got to take the rest of the Papa's Pilar Blonde home with me. A few more pictures and it was an awesome night! Good thing I wrote it all down. Let's do it again sometime, Pamela!